There’s that one song on the radio that says over and over, “It’s too late to apologize, it’s too late.” That song bugs me, because if you’re still alive, it’s not too late. I mean (Pretend I’m talking out loud to my radio in the car. It’s been known to happen. ), you might be too proud to apologize, or too scared to apologize, or it might seem too hard to apologize, but I guess that doesn’t make for good lyrics. Too late? Lame excuse. There’s a reason I chose to write about the importance of repentance and forgiveness in family relationships. The reason is me. I make mistakes all the time. Just yesterday, I lost my patience with both of my sons for performing below their potential at school. What I considered tough love was probably, in part, actually a little unkind. This morning, I lost my temper when my daughter refused to eat breakfast and responded to me with defiance. Here’s the thing: I am the parent, but I am still the learner, too. So when the Spirit pricks at my heart and says, “You could have handled that better,” then I need to swallow my pride and apologize. When I dropped off Natalie at school today, before I let her hop out of the van, I pulled her up onto my lap, looked into her pretty blue eyes, and said, “Does Mommy need to apologize?” She nodded her head. I told her I was sorry and that I had acted wrongly. I asked her forgiveness. I gave her a hug. And as I drove away, I promised Heavenly Father that I would try (again and again) to do better. “Let people repent. Let people grow. Believe that people can change and improve. Is that faith? Yes! Is that hope? Yes! Is it charity? Yes! Above all, it is charity, the pure love of Christ. If something is buried in the past, leave it buried. Don’t keep going back with your little sand pail and beach shovel to dig it up, wave it around, and then throw it at someone, saying, ‘Hey! Do you remember this?’ Splat! Well, guess what? That is probably going to result in some ugly morsel being dug up out of your landfill with the reply, ‘Yeah, I remember it. Do you remember this?’ Splat. 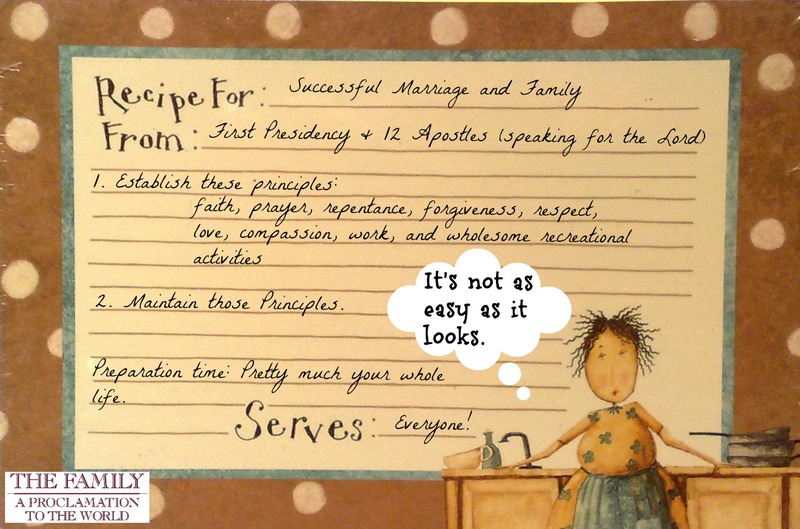 So when you find that your relationship with your spouse or your child is strained (as it will often be), put down your shovel and pail, put down your pride, and say “I am sorry.” When spoken with a humble heart, and then followed by an “increase of love” or any of the other ingredients, your marriage and family recipe is one step closer to successful. The song got it wrong: It’s never too late to apologize. Click here to read a complete version of The Family: A Proclamation to the World. The celebration will continue through Sept. 30. Remember that during the world-wide-web Family Proclamation Celebration, you can read more posts every day at We Talk of Christ, at Chocolate on My Cranium, and at Middle-Aged Mormon Man. I loved this so much, Steph. Mostly because of how similar we are in our parenting! I apologize to my kids constantly, and I used to write and talk about my apologizing as if it was a sign of a weakness: “Oh, I have to apologize a lot because I’m a terrible mother.” But this post made me realize that by apologizing, I’m actually being a good mother. Who knew?! Honestly, I never thought of it like that before. Thank you! What a great reminder! Its so easy to forget and lose our tempers with our kids and spouses. I have to apologize constantly, but I keep on trying. You’re right, the song got it wrong. It is never too late to apologize. It is amazing to me how receptive my children are when I apologize, so ready to forgive. I love those moments. The really teach me how I need to be. I needed this. Recently my five year old has been including in his prayers, “…and please bless we can have a nice mommy today…” Yeah. Thank you for the reminder that it’s never too late. Definitely needed this. Lately I have been in a rough patch in my mother hat, but this gives me the courage and faith and hope I need to keep trekking along … and to feel like and remember that I am not a failure because I am having to learn the same things over and over again. It also reminds me that I am not alone in my mothering feelings – apparently you and I and some of the above commenters all are working on similar things 😉 !! Thanks for taking the time to write this up and to link to some talks I am going to go read. but oh so hard to do. Ok I know that I already commented on this but I had to come back, one more time around. The final words from Elder Hales talk that you quoted above “…and do better…” really resonate with me. I think this applies to all relationships, regardless of which end of the conflict we are on. Forgiveness is a necessary step, we forgive the other party and ourselves for whatever, but then we need to do better next time. Otherwise we just end up in an endless cycle. This also reminded me of President Uchtdorf’f talk from General Conference, his “Stop It” talk. To me this post goes perfectly with what he said, stop it, be kind, if you mess up apologize and move forward you might be amazed at how blessed you are and what is in store. Sorry I’m probably going off on tangents here. Inspired words Stephanie, really! Thanks again for sharing this! I love the quotes you shared. Especially Elder Holland’s “Let people repent. Let people grow. Believe that people can change and improve.” Such a great reminder.